As winter finally starts to descend on us here at BC, Boston has me thinking of better days spent laying in the sun, listening to the water crash on the beach, drinking pina coladas. . . wait what was I talking about again? That’s right, the beach. Well in the spirit of feeling like all I want is a day in the sun, I thought I’d shed some light on one of my favorite beach destinations that people usually don’t know about: Positano, Italy. Getting to Positano from Rome includes a 3 hour train ride and 30 minute ferry, and it is truly the hidden gem of Italy. Not only does it contain some of the best Italian restaurants in the country and a world class shopping experience, Positano is also home to some of the kindest locals you’ll ever meet. If you don’t speak any Italian, prepare to learn just by being in this fabulous town. This place truly offers an authentic Italian experience, and without further ado, here are some of the things you cannot miss in Positano! One of the most unique things about Positano is that the only real way to get between the city and the fancy restaurants and hotels is by boat. Basically, the boats act as taxis on the sea; however, I recommend renting a boat for the day (usually the boat is already anchored and you simply receive a ride out to it) and spending the afternoon on the Mediterranean! Take a picnic and take in the views! For some reason, Positano is really known for its lemons. I’m sure there’s some historical reasoning for this that's very interesting, but truth be told the only significance it has to me (and to travelers everywhere) is that this restaurant on the docks serves fresh lemon sorbets in actual lemons, and they are amazing! Seriously, I haven’t stopped thinking about them since 2015 when I visited. Even the traveling to Positano is a destination in itself! Unless you rent a car and navigate those steep hills of the Italian Coast, the best way to make your way to Positano is by a ferry that leaves every day from Salerno and stops at Amalfi and Positano. Trust me, you’ll never forget your first glimpse of these colorful towns (and you’ll never want to leave)! What’s not to love about this restaurant? It overlooks the beautiful Mediterranean Sea, serves magnificent Italian food, and usually has a pianist or violinist working hard to set the mood. 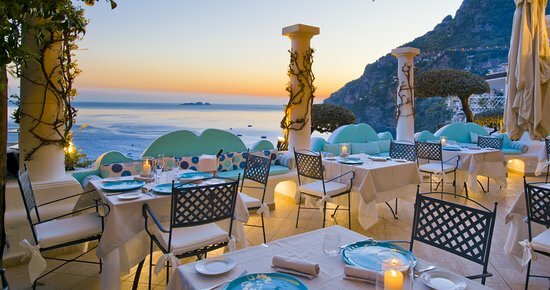 If you ever find yourself in Positano, I recommend saving this for your final dinner before departing, it really is the perfect goodbye to this charming town! So there you have it! If you ever find yourself in Italy don’t forget there’s more to it than Rome and Florence, and make sure not to miss this beautiful beach town!